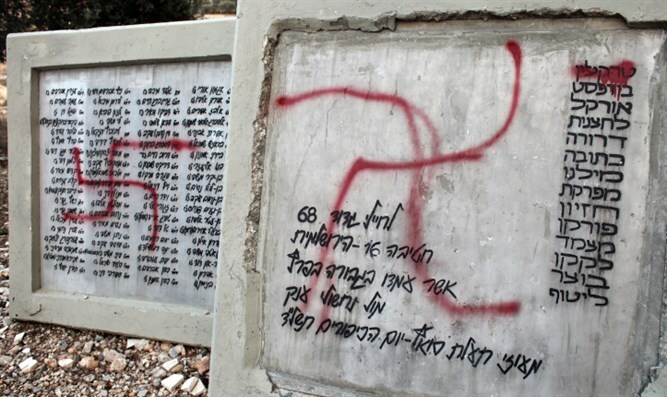 A teen was indicted for the anti-Semitic vandalism of a Jewish cemetery in New York state’s Orange County. The wall of the Beth Shalom Cemetery in the Town of Warwick, was spray painted with anti-Semitic graffiti including swastikas, “Heil Hitler,” and Nazi SS symbols more than a year ago on Oct. 9, 2016. Warwick is located about 90 minutes north of Manhattan. On Monday, the Orange County District Attorney’s Office indicted Eric Carbonaro, 18, of Warwick, on charges of fifth-degree conspiracy as a hate crime and two counts of tampering with physical evidence, both felonies. A conspiracy count in the indictment charges that Carbonaro conspired with others to commit third-degree criminal mischief as a hate crime, and also includes the evidence tampering charge. The indictment states that Carbonaro deleted photos and other information about the vandal attack from the phones of two other people, according to the Times Herald-Record. This includes a meme that read “secretly spray paints Jewish cemetery and gets away with it,” according to the report, citing the indictment. Two alleged co-conspirators were not named in the indictment.